An unprecedented spell of marine heat in Shark Bay, Australia, caused bottlenose dolphin numbers to decline for the following six years, a study finds. Dolphin population numbers fell by up to 12% following the 2011 marine heatwave, says the research. The event also led to a decline in the number of dolphin calves being born. Previous research has shown that marine heatwaves could become up to 41 times more likely by 2100 under a very high global-warming scenario. The findings “suggest that the ecological consequences of extreme weather events may be too sudden or disruptive for even highly adaptable animals to respond,” the authors say. Research suggests marine heatwaves have become 34% more likely over the past century, with rising global temperatures likely playing a key role in the increase. In 2011, Shark Bay – a world heritage area in Western Australia famous for its seagrass meadows and unique wildlife – faced an unprecedented marine heatwave. For more than two months, coastal water temperatures soared to 2-4C above average, damaging around 36% of the region’s seagrass meadows. In some regions, almost 90% of seagrasses died. The extreme heat also killed vast numbers of fish, including commercial populations of scallops and crabs. The new research, published in Current Biology, explores how this ecological turmoil could have affected a species near the top of the food chain: the bottlenose dolphin. From 2007-17, researchers monitored groups of dolphins living across a 1,500km area in the bay. The scientists took photographs of each dolphin, allowing them to be identified by their markings and the shape of their fins. These continuous observations allowed the researchers to keep track of population numbers and the number of new calves being born – both before and after the 2011 event. The results show that, in the six-year period after the event, dolphin numbers fell by up to 12%, when compared to the period before. The researchers hypothesise that long-term decreases in dolphin survival are a result of the “catastrophic reduction in seagrass coverage, which shows little sign of recovery”. The loss of seagrass “appears to be responsible for preventing fish stock recovery”, the authors add, reducing the food available to the dolphins. The results also suggest the number of dolphin calves being born was “significantly higher” before the heatwave. The chart below shows the average number of calves born each year both before and after the heatwave. Average number of dolphin calves born in Shark Bay, Australia per year before and after the 2011 marine heatwave (controlled for number of known mothers observed each field season). Grey shading shows the spread of the results and whiskers show uncertainty. A lack of fish prey after the heatwave could have led to “increased rates of abortion during pregnancy or increased neonatal pregnancy”, the authors say. In addition, lower food availability could have led to “suppressed ovulation or delayed sexual maturity” for some dolphins. Tracking each dolphin individually also allowed the researchers to work out if some dolphins were more resilient to the impacts of the heatwave than others. In Shark Bay, some dolphins are “spongers”. These individuals carry marine sponges on their rostrums, or beaks, when they dive for deep-sea fish. Researchers suspect that the sponges protect the animals’ beaks from sharp coral and stingray barbs, much like a glove protects a human hand. 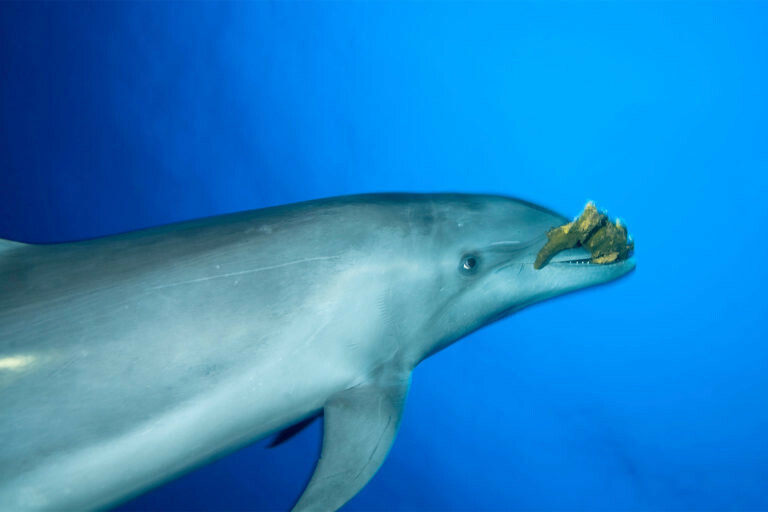 Bottlenose dolphin swimming with marine sponge. Image: Hubert Yann / Alamy Stock Photo. In this analysis, around 12% of the dolphins observed were spongers, while the rest were “non-spongers”. The researchers found that while numbers of non-spongers fell by 12% following the heatwave, numbers of spongers fell by a smaller 6%. 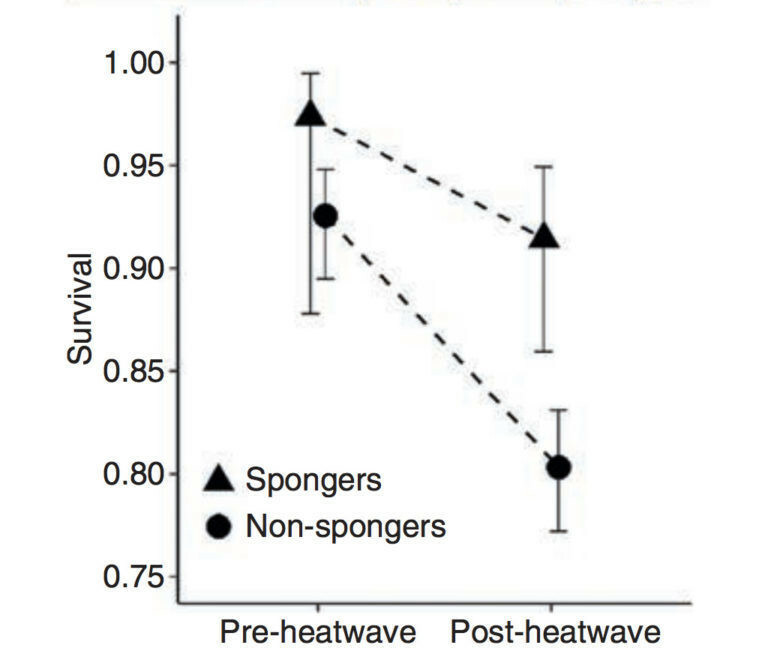 This is further illustrated on the chart below, which shows the chances of survival (0.75-1) for spongers and non-spongers both before and after the heatwave. Survival chances for “sponger” and “non-sponger” dolphins following the 2011 heatwave in Shark Bay, Australia. Spongers may have had a higher chance of survival because they are able to fish in the deep sea – meaning they may have been less affected by the reduction in fish availability near seagrasses, the authors say. The long-lasting impact of the 2011 event on dolphin survival “suggests that the ecological consequences of extreme weather events may be too sudden or disruptive for even highly adaptable animals to respond,” the authors say. Dolphins are thought to be highly adaptable because they show high levels of “behavioural plasticity” – an ability to alter their behaviour in response to changing environmental conditions, Wild says. But that adaptation is only possible “if the changes are slow enough”, she says. This article first appeared on Carbon Brief.